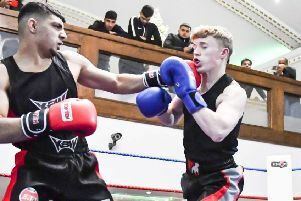 Cleckheaton continued their recent run of good form in the Allrounder Bradford Premier League last Saturday with a third impressive win on the bounce. Having toppled title chasing New Farnley and Pudsey St Lawrence in their previous two games, Cleckheaton followed up with a 90-run win over fifth-placed Methley. Their up turn in form has seen Cleckheaton move into seventh place with seven wins and seven defeats from their 14 matches. Opener Toby Thorpe produced a season’s best innings of 83, including 11 fours, Tayyab Tahir struck 32, while there was a quickfire 59 from 32 balls by John Wood, which included six fours and four sixes as Cleckheaton racked up an impressive total of 272-8. Sohail Raz claimed 5-70 for Methley and then went on to top score with 37. Cleckheaton’s recent run has coincided with Nick Walker hitting form and he again played a key role by taking 5-54 as Methley were bowled out for 182. The Methley innings also saw Yorkshire player Tom Kohler-Cadmore taking four impressive catches. Hanging Heaton were made to fight hard for their five-run win at Townville in a game which had several twists. Joe Fraser (27), Callum Geldart (26) and Ben Kohler-Cadmore (30) all made good starts before getting out as Heaton were reduced to 86-4 when batting first. Townville overseas player Shahid Nawaz (5-57) did the damage as he struck with early blows. Ishmail Dawood (57) led the revival scoring at a run-a-ball and hitting seven fours and two sixes to help boost the visitors’ total to 206 all out from 41.2 overs. The home side looked well placed at 113-4 in reply but lost their last six wickets for 88 runs as they were bowled out for 201. Richie Bresnan (56) and Connor Harvey (32) led the way but both fell with the score on 153 and with David Stiff taking 3-42, Hanging Heaton scraped home when last man Liam Booth was caught by Fraser off the bowling of Geldart with Townville five runs short. Heaton are fourth in the table, 21 points off the leaders, and they face a key game this Saturday at home to second placed Farsley. Bradford and Bingley remain in deep trouble having slipped into the relegation zone and they suffered a 94-run defeat to Lightcliffe. The win saw Lightcliffe move 36 points clear of the bottom two with overseas player Suleman Khan playing a key role with bat and ball. Lightcliffe were in trouble at 49-4 but Khan led a brilliant recovery as he made 115 including seven sixes and 10 fours. Opener Rhys Jowett (62) shared a fifth-wicket stand of 159 with Khan to help Lightcliffe up to 256 against a bowling attack in which paceman Jack Hartley (4-44) and spinner Bradley Reeve (4-79) shone. Jonathan Whitehead (42) led the Bradford & Bingley reply but lacked any real support and they were bowled out for 162 . Khan followed his efforts with the bat up taking 5-28 as Lightcliffe wrapped up victory and they travel to second-bottom Scholes this Saturday when Bingley host Cleckheaton and bottom side East Bierley travel to Pudsey St Lawrence.